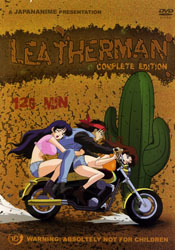 Description: This is very action packed and begins with Kurusu (Leatherman) grabbing a bag of belongings from a safe and taking off on his motorcycle. His past partner (Shisui) is instructed by his boss to tell Kurusu to come back with the items he took from the safe to avoid certain death. Throughout this feature and because Kurusu is trying to evade capture he experiences many things from being hospitalized from a motorcycle fall, having his bag stolen and most notably having elicit sexual encounters with many women.